Eschew the tourist crowds and head to Glacier 3000 and Seebad Eich. Satisfy your inner culture vulture at Castle of Gruyeres and Glasi Hergiswil. 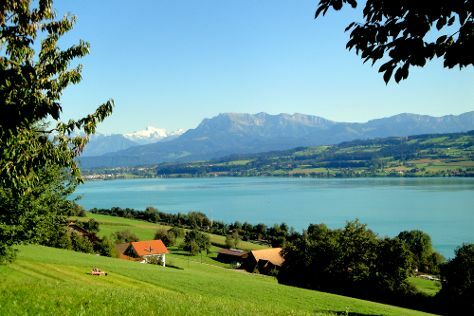 Venture out of the city with trips to Spas & Wellness (in Lavey-les-Bains), Castillo Oberhofen (in Oberhofen am Thunersee), Thun (Thun Castle, Church Scherzligen, & more), Sion (Church-Fortress of Valere & Chateau de Tourbillon), Uferpromenade Weggis (in Weggis), Jungfraujoch Sphinx Observatory (in Jungfraujoch), HR Giger Museum (in Gruyeres), Schilthorn - Piz Gloria (in Murren), Salt Mine at Bex (Mine du Sel) (in Bex), Tierpark Goldau (in Goldau), Bergbahnen Meiringen-Hasliberg (in Meiringen), Brig (Simplon Pass, Thermal Spas, & more), Teufelsbrucke (in Andermatt), Orselina (Sacromonte e Santuario Madonna del Sasso & Cardada) and Lavey-les-Bains (in Aigle). To find where to stay, photos, other places to visit, and other tourist information, you can read our Fiesch in Valais itinerary planner. If you are flying in from Netherlands, the closest major airports are Zürich Airport, Basel Mulhouse Freiburg and Geneva Cointrin International Airport. Cap off your sightseeing on the 8th (Sat) early enough to go by car back home.